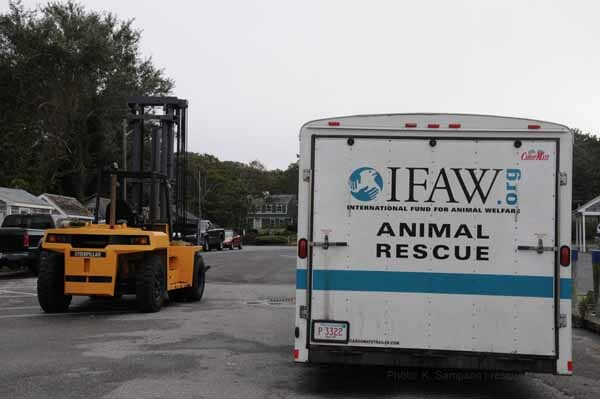 The photo below shows the IFAW animal transport trailer as it backed down the dock to prepare to unload the giant turtle. The yellow machine on the left is the largest forklift I have ever seen - the forks alone were 16 feet long. We called Harwichport Boat Works Inc. to inquire about a forklift and let them know what we were doing; within seconds they not only agreed to help but donated their services! 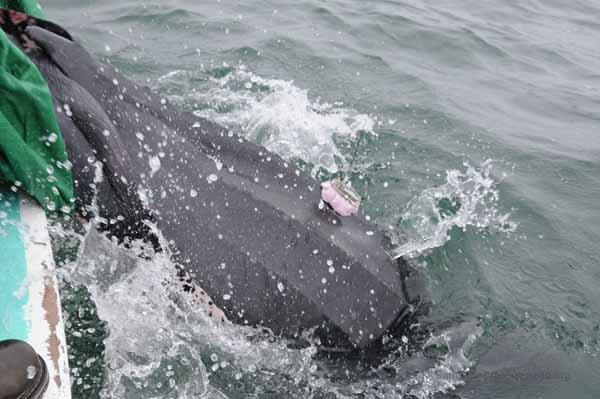 Before removing the turtle from the trailer, our colleagues Kara and Mike Dodge applied a satellite tag. 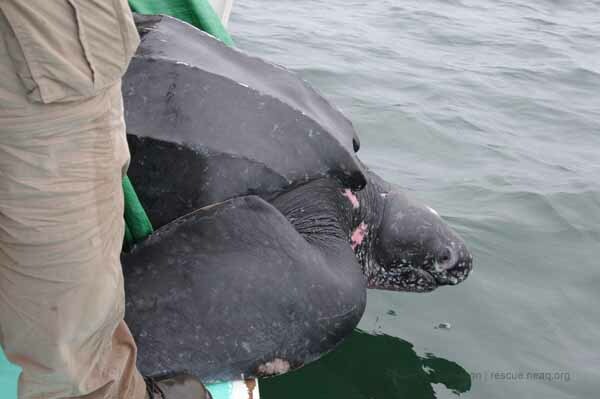 Dr. Innis and I have been working with Kara on her long-term field study of leatherback sea turtles. Kara has applied satellite tags to many turtles throughout her research so it made sense to bring in the experts. 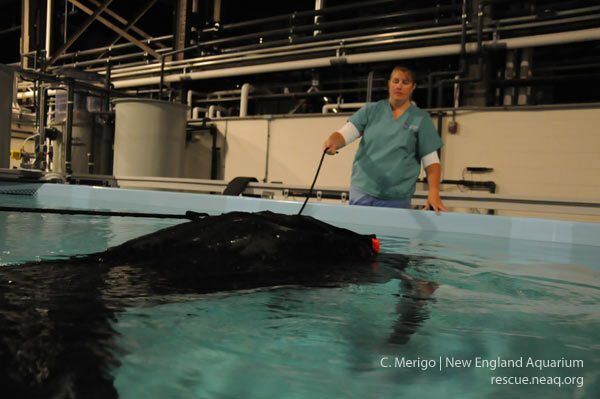 In the photo below Kara and Mike Dodge complete the final stage of the tag application while Dr. Innis monitors the turtle. 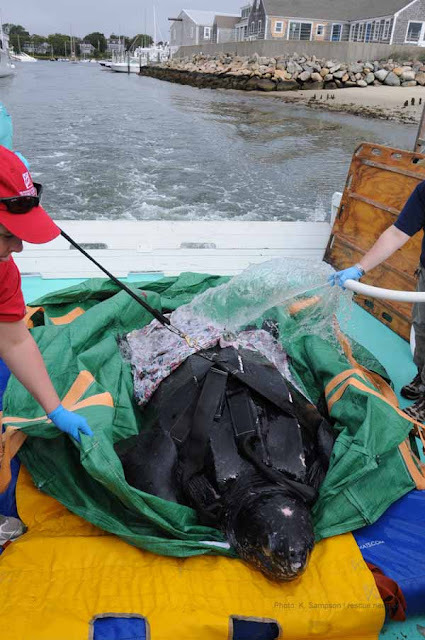 The satellite tag sits on a protective putty-like substance to ensure that the tag does not scratch or otherwise irritate the skin of the turtle. 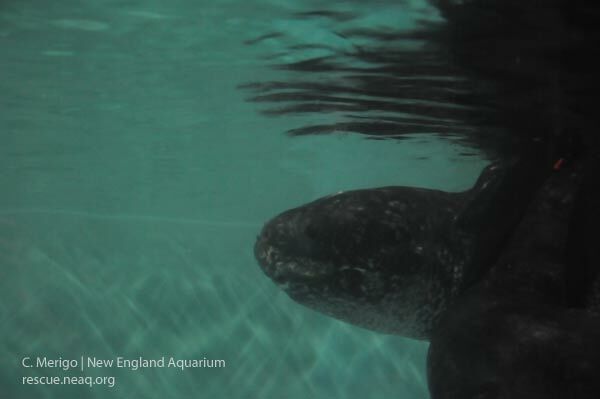 Leatherback sea turtles get their name from the smooth leathery skin covering their carapace (upper shell). Dan, the Harwichport Boat Works operator, slowly advances the long forks into the trailer to pick up the lift bag. The fork truck operator picked this turtle up with gentle and careful movements that didn't seem possible for such a large piece of equipment. The turtle didn't move much during this part of the transport, which was comforting to all of us. 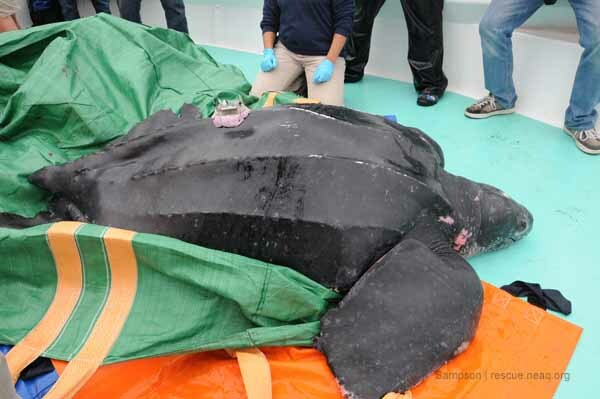 Our enormous patient was placed so gently on the boat waiting below that it was difficult to believe their was a giant turtle in there. 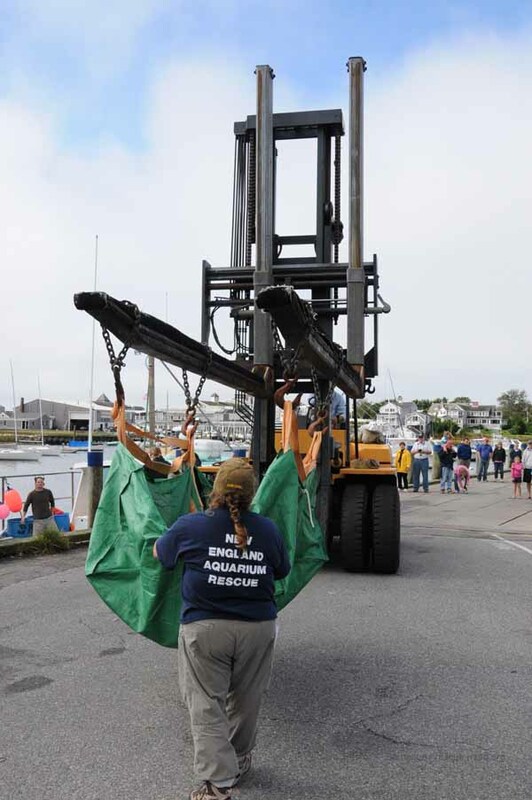 This is a great photo of the forks as they lowered the turtle onto the deck of a lobster boat. Boat captain Mark Leach, who captains his vessel for our field research, made his boat ready for the precious cargo. 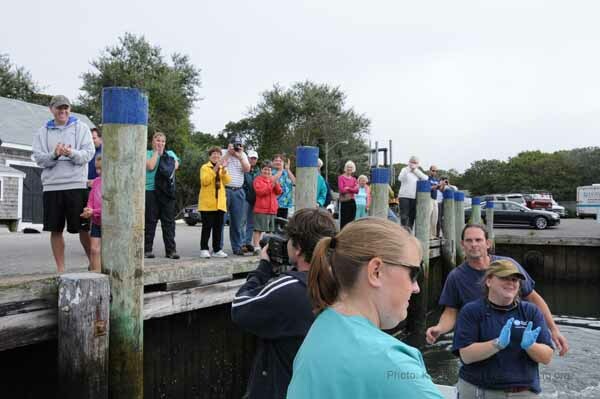 Word must have leaked out because we had a small gathering of folks at the dock to see us off. 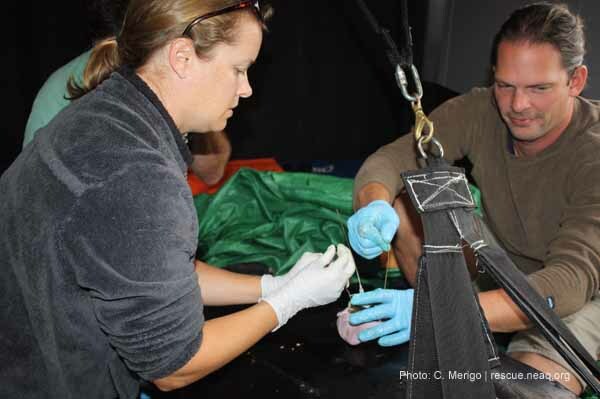 In the photo below Kim Durham, RFMRP biologist, begins to flatten the lift bag to allow the turtle more room. 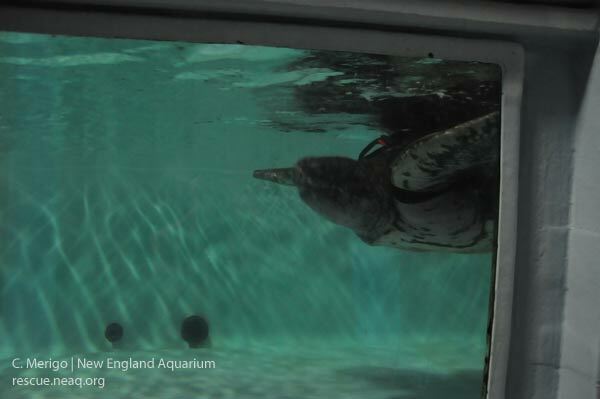 The turtle is also hosed with water to keep him cool and moist. 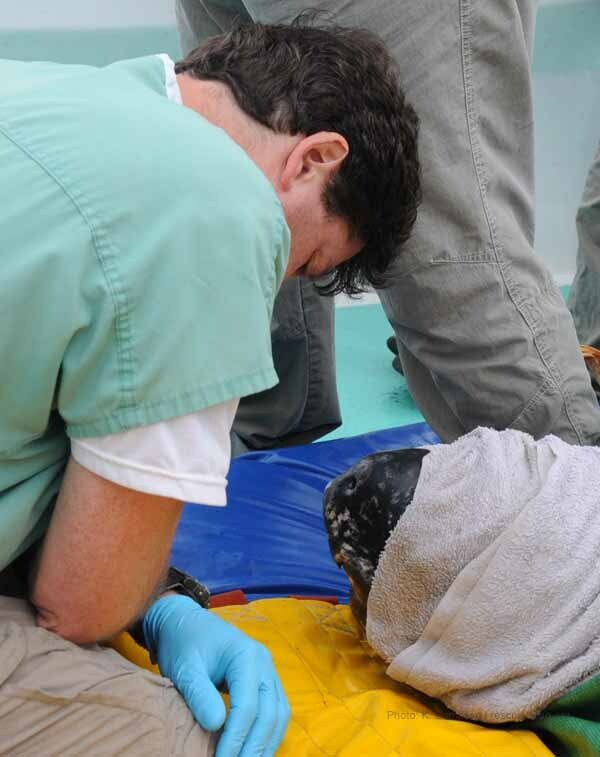 Dr. Charles Innis, the Aquarium's Director of Veterinary Medicine and Animal Health, monitors the turtle's respiratory rate during the boat ride to the release it. You can see a moist towel covering the eyes of the turtle. This is a technique used to reduce stress. 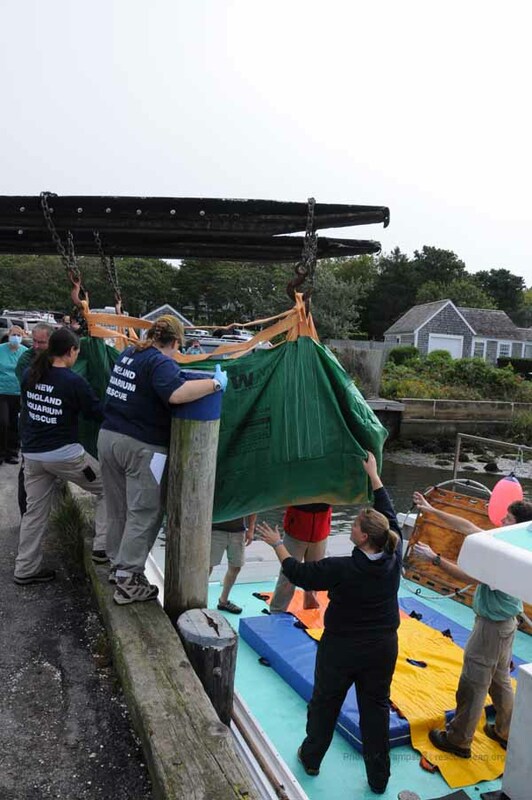 The release team turns the lift bag to face the giant turtle toward the stern of the vessel. 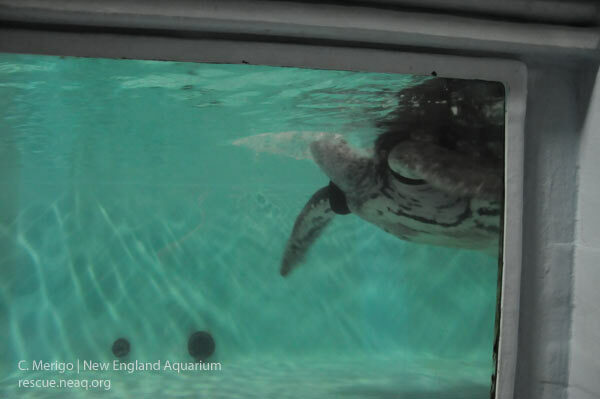 The pre-release photo below provides a good look at how much of this turtle's front right flipper was missing upon stranding. The injury was not fresh and the tissue was healing nicely. The giant turtle as he begins to push off the back of the vessel. This turtle went into a long dive upon entering the ocean. 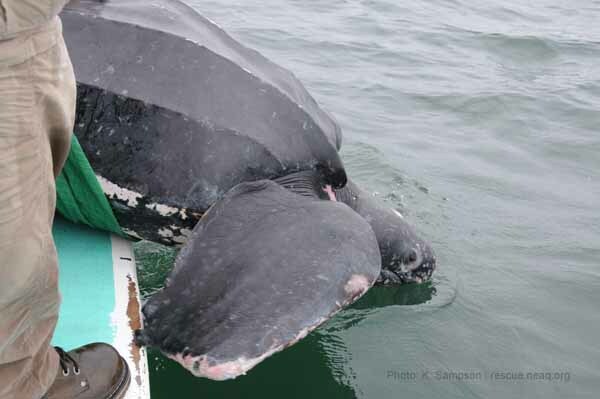 The satellite tag has been transmitting data since this rare, giant leatherback was released. No spoilers here folks, you'll have to checkout the next blog if you want to see where he went and how we think he is doing thus far. Thanks to those of you who have contacted us with words of support. We are grateful for your encouragement. 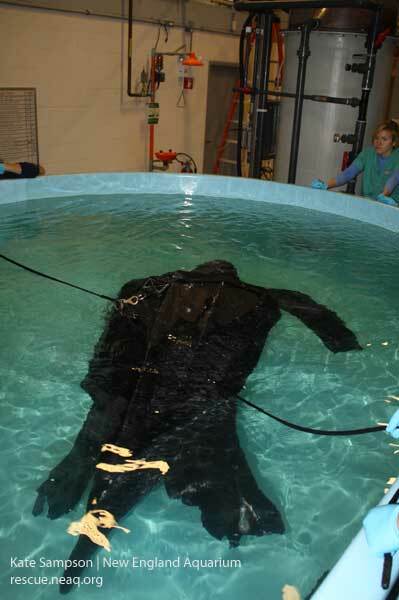 The photo below shows a lift bag being lowered into the tank. 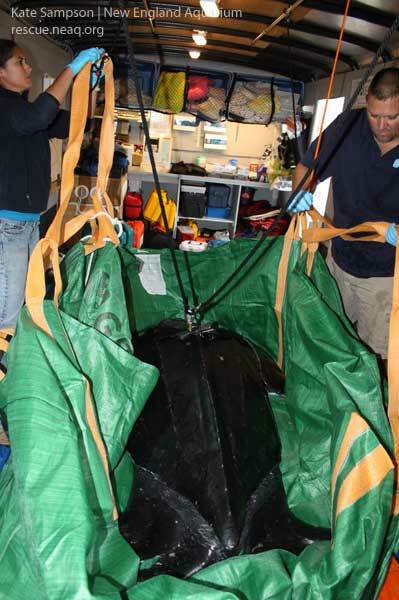 The lift bag has a weight capacity of 3,000 pounds but we used two to increase peace of mind. 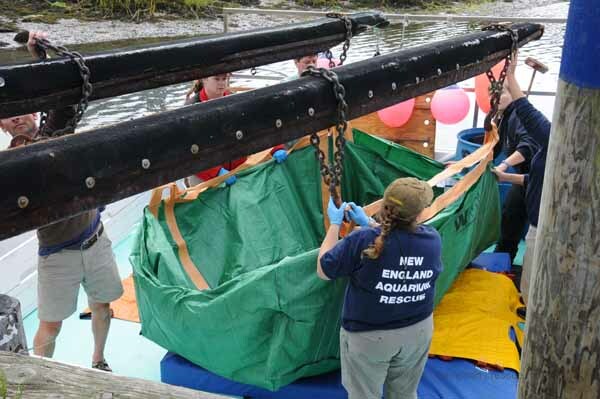 As you will notice from the photos, we brought in a lot of help to make sure the job of removing this giant turtle from the rehab tank and transporting the animal to the boat was done safely and quickly to minimize stress for our patient. 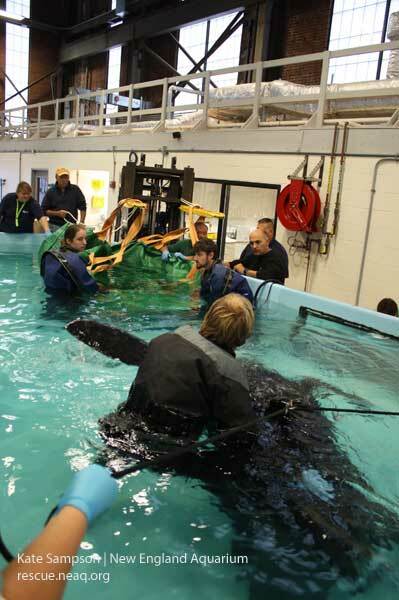 While we worked to get the forklift in place and the lift bag lowered into the tank, the leatherback rested underwater at the far end of the tank. 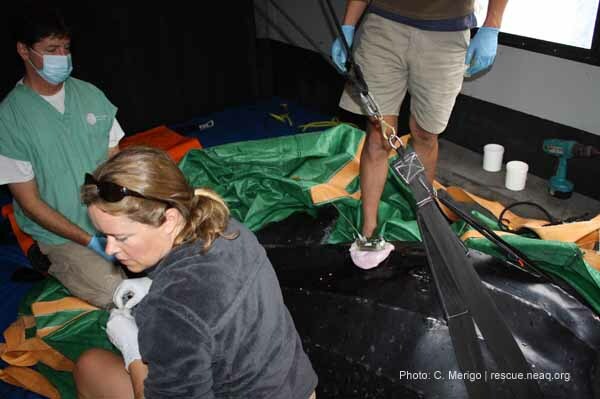 This photo shows the turtle resting as we prepare the lift/transport bag. This is a great photo of the full length of the tail on this turtle. 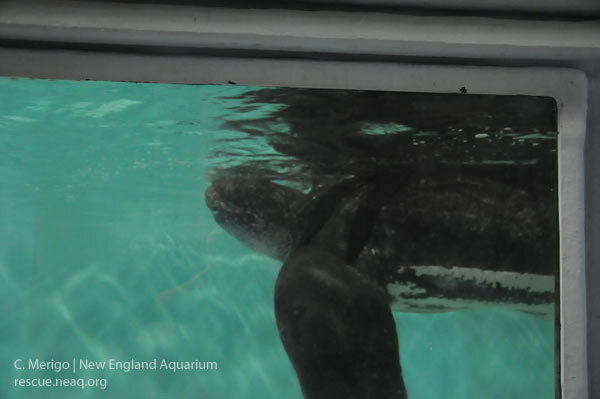 Adult male leatherback sea turtles have a large and very long tail as seen in the photo. 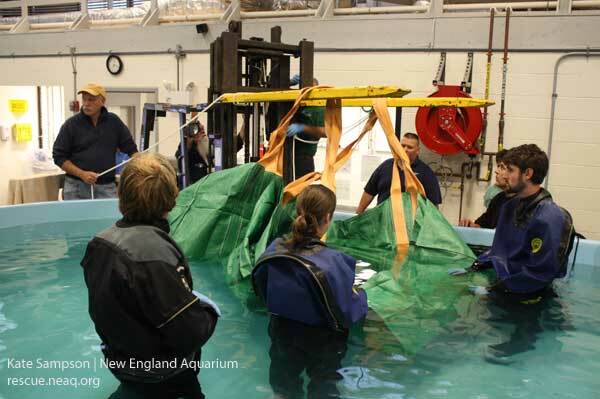 This photo shows the lift bag submerged, while we slowly guide the turtle into the bag. It is important to note that while I use the term "lift bag," it is rectangular in shape and does not actually close as the name "bag" implies. The team guides the turtle all the way into the lift bag and then prepares to drain the majority of the water from the bag. The turtle as he is being lifted from the pool. The bag obviously obscures the camera's view of the turtle but trust me, he is in there! In case there were any non-believers out there...below is a photo of the giant turtle inside the lift bag as our forklift operator, Al, slowly drives the turtle out to a waiting trailer. 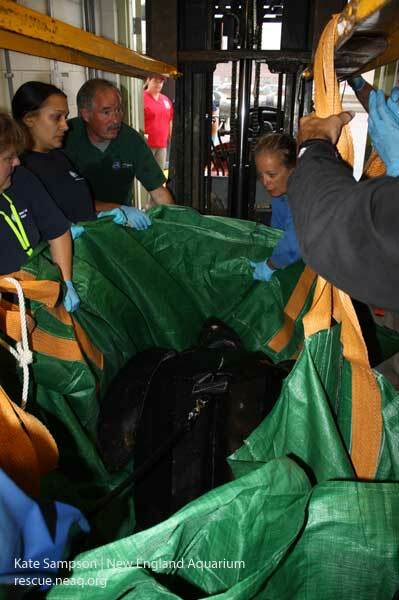 Once outside the building, the turtle in his lift bag was gently placed on waiting stretchers. 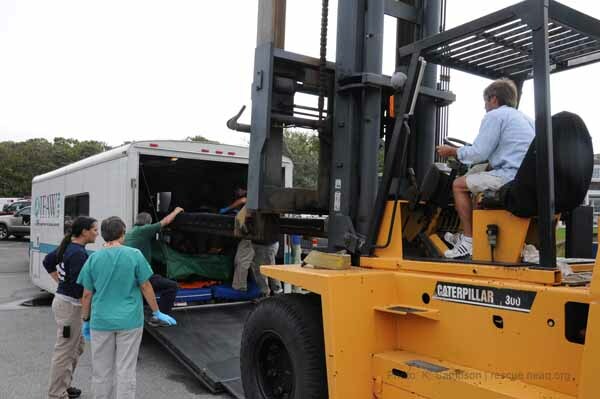 Al, our forklift operator, moved this giant turtle so smoothly and gently you would have thought a baby was in there. 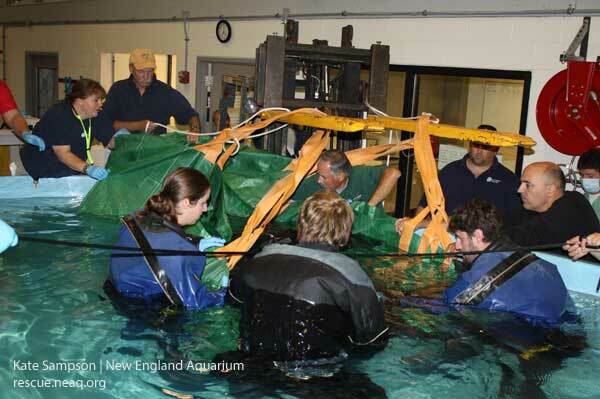 The photo below shows the turtle being lowered onto the stretchers. 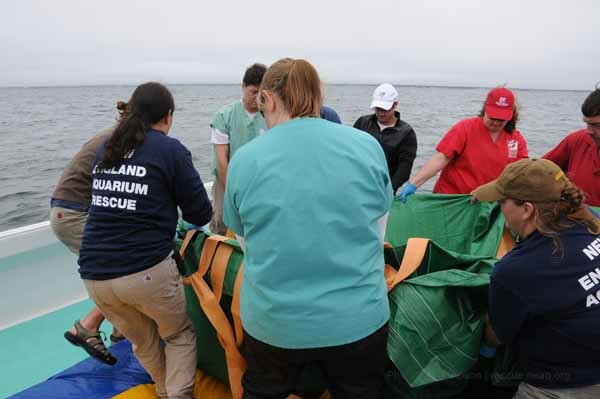 The New England Aquarium doesn't own an enclosed rescue vehicle to move live, large patients such as this turtle, so we called our partners at the International Fund for Animal Welfare (IFAW), who were glad to lend a hand. 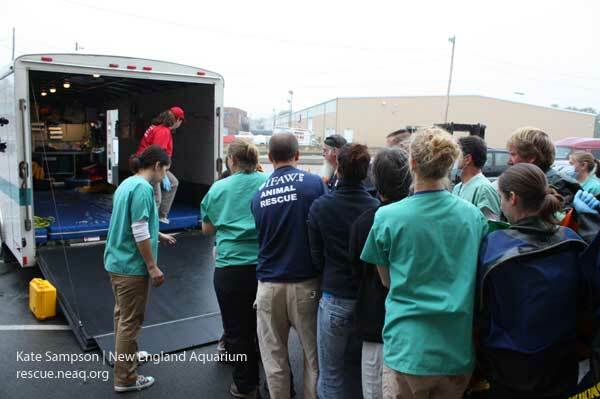 Below the team slowly walks the turtle into the back of the IFAW trailer. The person on the left is there to safely guide the team onto the ramp and prevent people from stepping off. The person in the background in red is my colleague Kim Durham, from the Riverhead Foundation for Marine Research and Preservation (RFMRP). Kim and the nice folks at the RFMRP were kind enough to lend us a satellite tag for this turtle...and Kim drove it to us overnight. In this photo Kim guides the lifters safely into the back of the truck. 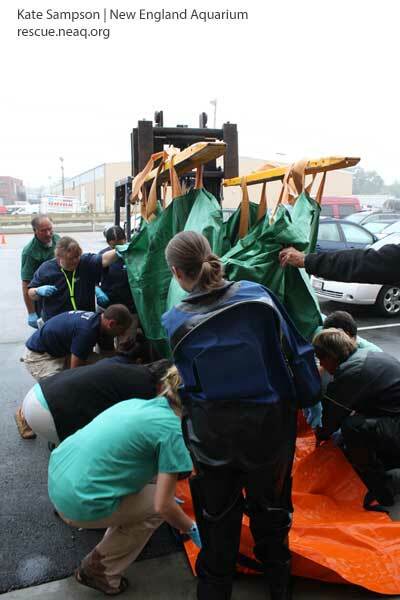 Once in the back of the IFAW animal transport trailer, we secure the lift bag in place to help keep the turtle from bulldozing his way around the inside of the trailer. 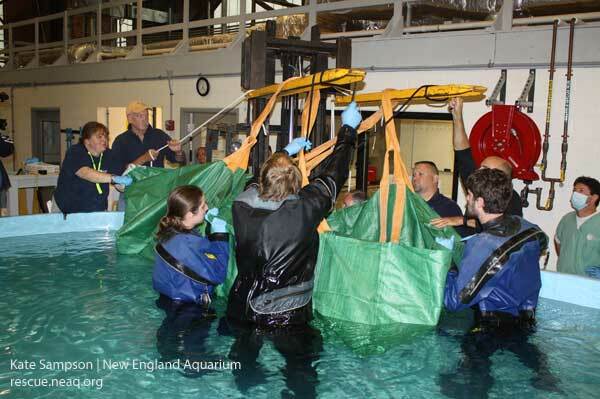 Below, New England Aquarium staff members Matt and Tina secure the lift bag to the safety railings. You will notice we tied the turtle's harness to the safety railing as well. 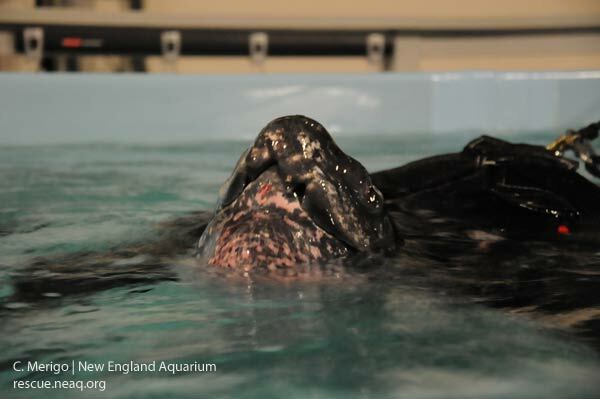 Remember, by this point the turtle had responded to the treatments and had regained quite a bit of strength. 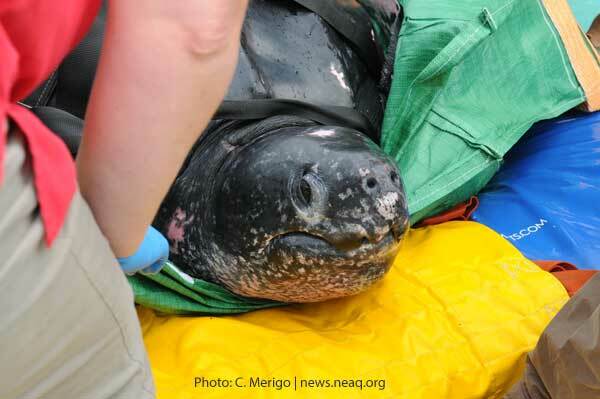 Nest stop...the giant turtle is loaded onto a lobster boat and released into Nantucket Sound. Stay tuned for the release blog.